The nation discovered to their shock and horror that the funds they were counting on to ease their burdens late in life were now being spent by baby boomers in tropical bliss. 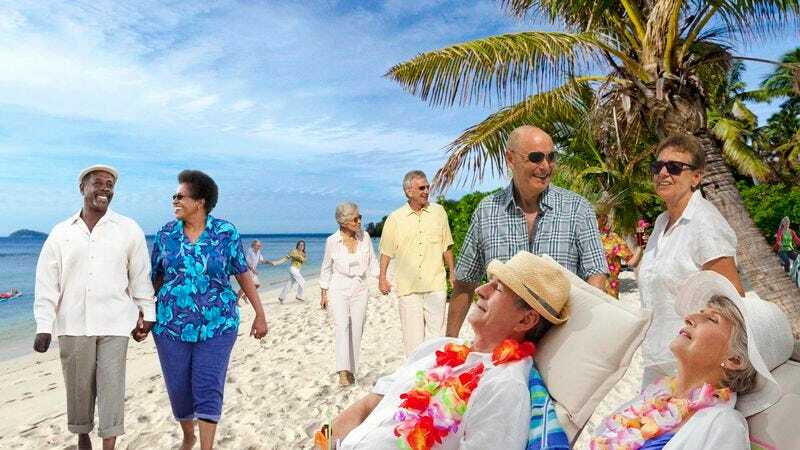 WOODLAWN, MD—Arriving en masse to the Pacific island nation after fleeing under the cover of night, 76 million baby boomers reportedly escaped to Fiji on Friday after completely draining the nation’s Social Security and Medicare accounts. Sources said the daring $3.1 trillion operation was discovered early this morning as stunned federal employees checked both programs’ reserves only to find that each now held a total of $0.00, the apparent culmination of a plan that reportedly was meticulously organized and executed over the last 30 years. Shocked citizens from around the country were forced to contemplate how they could ever replace the funds they had been counting on for their own healthcare and retirement income. According to sources, the entirety of Medicare and Social Security was slowly siphoned off as the post-war generation built trust by assuring the other 240 million Americans that they would collect their share eventually. However, since decamping, observers say the baby boomers have spent the funds on opulent lifestyles in the tropics where they intend to live out the rest of their days relaxing in comfort, all at the expense of the children and grandchildren they reportedly claimed to be concerned about. As they awoke to find the baby boomers gone, shocked citizens from around the country were forced to contemplate how, and even if, they could ever replace the funds they had been counting on for their own healthcare and retirement income. Speaking to reporters, many expressed anger and disbelief that their hard-earned money would be used to pay not for their own basic living expenses, but instead for expensive new wardrobes, luxury hotel suites, and sunset champagne cruises to private Fijian lagoons. “We may never recover after what they did to this country,” he added.